What is the “crisis in economic expertise” about? Trump’s decision to demote whoever might be nominated chairman of the Council of Economic Advisers (CEA) from his cabinet has been interpreted as a final blow to a tough year – in which economists’ advice has been systematically ignored by voters- within a tough post-financial crisis decade. Economists are under the impression that since 2008, their expertise has been increasingly challenged, and they have offered several analyses and remedies: more micro, more data, more attention to distribution and less to efficiency, more humility, more awareness to the moral and political element in economic expertise, more diversity and more interdisciplinarity –economic education included- Few of these however rely on the whopping literature on the history and sociology of scientific expertise. A systematic review would take a book, so let’s jump to how it helps elucidate what the problem with economic expertise is. Essentially, scientists produce knowledge about the word, which they believe is, if not true, at least robust or reliable and objective because produced systematically, validated according to vetted methodologies, and often quantified. Putting this knowledge to work is what expertise is about. It is thus intimately tied with 1) application, 2) building relationships with non-scientific communities, including catching attention, building trust and establishing markers of expertise (such as a PhD). Audiences and clients for economists’ expertise are many: public bodies, in particular policy-makers (from presidents to independent regulation agencies to statistical bureaus and Feds. I tentatively put courts in that category); but also private ones (businesses, banks, IT firms, insurance companies), the media, and “the public,” citizens who make economic decisions, and, most important, vote. Over the past decade, the “crisis in expertise” has been much about loosing voters’ trust. Yet there is no evidence that economists have ever been able to influence the public at large, nor that they have put much effort in trying to do so (Friedman and Galbraith might be exceptions here). Anxieties raised by Trump’s dismissal of economic expertise are more about loosing policy-makers’ attention, though the current US president might be an exception in that his views echo the public-at-large rather than the standard policy-maker. There is no sign that economic expertise has lost currency with journalists, even less with the private sector: economists get better wages than any other discipline (but law? ), receive insane amount of money for private consulting, and IT firms have gone a long way toward luring economists out of academia. One important qualification, here, is that economists don’t merely produce knowledge; they also produce tools of analysis, technologies. One possibility, thus, is that the type of economic expertise in demand has shifted: substantial policy or management advice is loosing ground, while technical skills to implement tools and provide data analysis are on the rise. Histories of how economists painfully gained reputation and trust during the XXth century abound. Most of them are focused on public policy – data on private businesses are more difficult to obtain, and tracking economists’ influence on the public is elusive–. And none of them fail to mention the canonical proof that economists’ expertise is/have been influential: it was Walter Heller, 4th CEA chairman, who convinced J.F. Kennedy and L.B. Johnson to propose a massive income and business tax cut, passed by the Congress in 1964. The facts are well-known: Eisenhower’s legacy was a sluggish decade, with growth stuck at 2,5% per year and unemployment at 8%. Recurring budget deficit, which topped 12 billions in 1959, prevented much needed defense, education and welfare expenditures. Kennedy’s campaign was consequently focused on the promise of restoring growth, of “get[ting] this country moving again.” The candidate had nevertheless straightforwardly rejected the fiscal stimuli proposed by those economists, including Paul Samuelson, who had participated in his Democratic Advisory Committee. Kennedy came to the oval office with the notion, inherited from his father, that the budget should be balanced and the money supply tightly controlled. 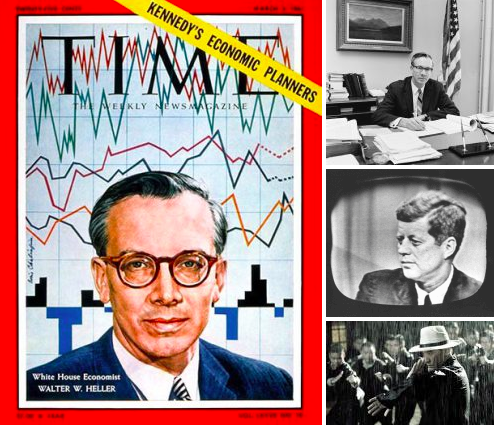 Under the influence of his CEA chairman, Walter Heller, Kennedy became more favorable to sustaining a budget deficit, and by early 1963, he had submitted to Congress the largest peacetime voluntary budget deficit: $12 billion. He proposed to reduce income tax rate from 20-91% to 14-65% and corporate income tax rate from 52 to 47% and to abolish loopholes and preferential deductions to enlarge the tax base. He promised that, should the Congress pass his tax cuts, the 1965 budget would be equilibrated. The proposal was finally enacted in 1964, under Johnson. 1965 saw the smallest Federal deficit of the decade (1 billion), strong growth and unemployment down to 4%. The trend persisted throughout the decade, with inflation pressures slowly building in response to Johnson’s spending frenzy. Thought the contribution of the tax cut to this period of prosperity, and to subsequent imbalances, is still fiercely debated, its positive spillovers on the whole profession commands wide agreement. Heller’s CEA has contributed to shift economists’ image from ivory tower technicians to useful experts and to strengthen public trust. It has been heralded as the canonical example for economists’ ability to increase society’s welfare, a symbol of a (some would say lost) golden age. The scope of Heller’s influence has, in fact, extended ways beyond the tax cut. He was instrumental in putting poverty on the presidential agenda, and, as recently unearthed by Laura Holden and Jeff Biddle, he was the one who turned human capital theory into an argument in favor of federal funding for education. His peculiar status as the “economic experts’ expert” was immediately recognized. He made Time’s cover twice in two years. No other CEA chair made the cover of the magazine before the late 1976, and none ever made it twice as CEA chair. But if the fallouts of his expertise are well known, its determinants are less so. The nagging question remains: how did he do it? Let’s begin with the non-replicable aspect: Kennedy’s knack for economics, his willingness to discuss policy as well as theoretical aspects, his eagerness to read and digest memos and newspaper articles, his systematic mind. The legend says that when James Tobin told him that he may not be the best pick as CEA member because he was a “sort of ivory-tower economist,” Kennedy replied “that’s the best kind. I’m a sort of ivory-tower president.” Granted, this is not likely to happen anytime soon, but the president is not the only policy-maker economists want to influence, right? And that Kennedy was drawn to economics didn’t make Heller’s job easier. Not only was the president surrounded by advisors with conflicting economic policy views (see below), but it wasn’t clear, back then, that the role of the CEA as defined in the 1946 Employment Act was to promote specific policies. First CEA chairman Edwin Nourse and Eisenhower’s chairman Arthur Burns conceived their role as being mere advisors to the president, providing technical reports and private forecasts and refraining from making public statements or testifying before Congress. The only exception was Truman’s second chairman, Leon Keyserling, whose more activist stance created a stir. It was nevertheless one more congenial to Walter Heller’s vision of the role of the economists within society. The son of a civil engineer committed to public service, Heller was, by his own admission, one of those children of the Great-Depression who turned to economics because “explaning why [the economy flat on its back] and try to do something about it, seemed a high calling.” Economists from the University of Wisconsin, where Heller got his PhD, boasted a strong record in successfully influencing Wisconsin’s policy-making, not least his PhD advisor, fiscalist Harold Groves. Heller’s wartime contribution to fashioning tax increased at the Treasury, his participation into the Marshall Plan and his lobbying for federally funded education on behalf of the National Economic Education in the late 1950 strengthened his identity as a “policy-oriented economist,” a “do-something-about-it economist.” As he was nominated CEA chair, he was ready, not only to provide forecasts and technical advice, but also to advocate for those policies he believed were supported by good science, to convince the president, to testify before Congress, to engage the media and the public. He was also willing to give much latitude for his two fellow committee members to do the same. As extensively documented by Michael Bernstein, macroeconomist James Tobin and budget specialist Kermit Gordon fully shared Heller’s conception of the role of an economic expert. Tobin later explained that “economics has always been a policy-oriented subject” and that applications of theories to “the urgent … issues of the days” were essential. In a 1961 Time article, the 3 frontiersmen thus described themselves as “pragmatists.” Promoting the tax cut really was a team effort. All 3 council members had extensive discussions with Kennedy on policy as well as on the common theoretical foundations they had borrowed from the New Economics articulated by Paul Samuelson at MIT. For Heller genuinely believed that his policy advocacy was rooted in solid science, and that his task essentially consisted in educating the president. Thought it was only later that he came to call himself an “educator of presidents,” the education trope was already pervasive in his favorite educative tool: his memos. His team literally flooded the president with more than a 1000 memos during the Kennedy/Johnson presidency. Hellers’ ones were of a special kind: short, devoid of technical jargon but not of figures, with a clear and apparent structure, and main arguments systematically underlined. They usually began with a quantified depiction of the economic situation, a brief policy proposal, and extensive response to possible counterarguments. These were so convincing that, Heller remembers, Johnson once help up one of his memos at a Cabinet meeting and said “Here’s one of Walter Heller’s memos. See how it’s set up? That’s the way I want you all to write your memos.” Below is what I believed was one of the memos that convinced Kennedy to endorse the 1963 Economic Report and the Special Message to the Congress on Tax Reform Heller had contributed to draft. 3) Though Heller refrained from using technical terms in his memos, he did not shy away from quantification. Early on, he equated “bridging the gap” with a more specific target, the 4% unemployment rate. It was, Heller hypothesized from his knowledge of the previous decade, the rate that allowed the highest non-inflationary growth. At the end of 1961, he sensed that he needed a better picture of how increasing the capacity of production utilization could help reach this target. He therefore asked CEA staffer Arthur Okun to quantify the “output gap.” Okun’s resulting working paper, famously remembered for introducing the “Okun law” testifies to the influence of policy concerns on economic research. In line with Heller’s objectives, Okun set “full employment without inflationary pressure” at 4%, without further justification. Another target would change the figures, not the calculus, he warned. In the introduction, he further explained that “if programs to lower unemployment from 5 ½ to 4 percent of the labor are viewed as attempts to raise the economy’s “grade” from 94 ½ to 96 [use of production capacity], the case for them may not seem compelling. Focus on the ‘gap’ helps to remind policy-makers of the large reward associated with such an improvement.” Using 3 different techniques to estimate the relationship between unemployment and real GNP, he unequivocally concluded that each extra percentage point in the unemployment rate above four percent has been associated with about a three percent decrement in real GNP. It was not the only case where Heller’s quest for sound theoretical and empirical basis for the policies he was advocated stimulated new research. At about the same time, he asked Burton Weisbrod, senior staff economist at the CEA, to expand his quantitative analysis of the external benefits of education, Holden and Biddle relate. Educating the president was only part of Heller’s job. The whole decision chain had to be persuaded. As important, then, was educating skeptical presidential advisors, and neutralizing those who wouldn’t surrender. In those years, macroeconomic expertise within the executive branch was scattered across the CEA, Douglas Dillon and Robert Roosa’s Treasury, David Bell’s Bureau of Budget and the Federal Reserve Board, whose chair, William McChesney Martin, served between 1951 and 1970. Their task was to provide forecasts, advice and coordination, and prepare the budget. Beyond routine disagreement on forecasts, these economists held divergent visions of the major economic threat Kennedy had to deal with. Dillon, Roosa and Martin were worried about the growing imbalance in foreign payments and the associated risk of gold drain, and Martin also closely monitored the deterioration of the value of the dollar. They also believed that the high level of unemployment was the consequence of the “changing structure of the labor force” rather than of slacking demand. To dismiss “the official Republican diagnosis (or excuse) is that growing unemployment is due to changing structure of the labor force”, Heller claimed that science was on his side. An early 1961 memo accordingly contrasted “the ‘correct’ analysis […] would be that most of our unemployment would respond to over-all measures designed to stimulate demand and investment […] would call for substantial additional spending, tax cuts and deficits” with “the ‘incorrect’ policy position that most of the unemployment and under-capacity operation are the result of structural factors.” Heller also emphasized the non-partisan character of his policies by providing long lists of those individuals and organizations across the political spectrum he has managed to convince that a tax cut was the best policy. A December 1962 briefing book listed the Committee for Economic Development, the AFL-CIO, New York Governor Nelson Rockefeller, the National Association of Business Economists, and, ironically, most of Eisenhower’s CEA members. The CEA also regularly provided memos debunking newspaper articles dealing with excess-demand inflation and the risk of government spending-induced inflation. Neither was Heller shy to testify before the Congress’s Joint Economic Committee, in an effort to win their support for the forthcoming bill. In the end, the only enduring resistance came for Fed chairman Martin. The longstanding fight for influence between Martin and Heller wasn’t restricted to the tax cut issue. Martin wasn’t trained as an economist, and was therefore impervious to Heller’s arguments. He had also taken early steps to assert the Fed’s independence from the executive branch, and would constantly act to remind it. When Kennedy was elected, he did not offer his resignation, as was the practice in those years. To counter the deteriorating balance-of-payment, stabilize the value of the dollar and contain the inflationary pressures which he believed would derive from a tax cut, Martin intended to raise interest rates. In the early months of the presidency, he made it clear that he didn’t see fit to offset the upward pressures on the interest rates associated with the fledging recovery. Sensing that he would never convince Martin, Heller labored toward (1) finding alternatives to control inflation pressures. To this end, he set up wage and price guideposts whereby wage increases should be guided by expected gains in productivity. And in the spring of 1962, he convinced Kennedy to oppose price increases in the Steel industry. (2) alleviating the balance-of-payment constraint. The Gold drain was accelerating since the beginning of 1962, with the consequence that Martin was taking measures to raise the short-term interest rate. Heller convinced Kennedy to make a public statement to restore faith in the dollar. “The United States will not devalue its dollar … I have confidence in it, and I think that if others examine the wealth of this country and its determination to bring its balance of payments into order, which it will do, I think that they will feel that the dollar is a good investment and as good as gold,” Kennedy declared during a transatlantic TV broadcast on July 23 1962. Heller never succeeded in bringing Martin into line, and the Fed rates doubled during Kennedy’s presidency. He nevertheless felt he had avoided more dramatic hikes on short and, more important for the policy mix, long term rates. It was Kennedy himself who eventually suggested that “the Council do some serious thinking about how to use the White House as a pulpit for public education.” In his memos, Heller therefore looked for ways to overcome “American people and the Congress’s strong aversion to budget deficit.” His solution was to “repeat ‘deficit of inertia vs creative deficit for expansion” argument,” and this was precisely how Kennedy January 1963’s message to Congress was framed: “our choice today is not between a tax cut and a balanced budget. Our choice is between chronic deficits resulting from chronic slack, on the one hand, and transitional deficit temporarily enlarged by tax revision designed to promote full employment and thus make possible an ultimately balanced budget,” the president asserted. Next How much do current debates owe to conflicting definitions of economics? Do you mean “tough” year? Also “tough” financial crisis? Yes, indeed. Thank you for the pointer!